The Air King 9018 is our best wall mounted fan, which can oscillate up to 90 degrees and can be locked into a steady position. The metal front grill is durable and impact resistant. The blades are made of polypropylene that can take industrial use due to being chemical resistant. Our step-up pick is the OEMTOOLS 24883 Fan and this wall mount fan has aluminum blades for durability and has a 6-foot power cord. It can be situated in a garage and it is also energy-efficient. You can also use it on some warehouses and it is quite easy to mount. The budget pick is the Hurricane Classic 736503 and as a combination of plastic and metal, this durable budget pick can oscillate up to 90 degrees and has a neck support made of steel as well. The two pull cords on the wall fan can control the speed and the oscillation of the fan. A wall fan is a type of fan that is mounted on the wall. It is usually controlled with a rotating switch and is pulled with a string that switches it one dial step at a time. Wall fans are usually the same with the speed settings of most electric fans and can be installed and mounted onto any wall with a simple drilling operation. One of the benefits of a wall fan is that it is greatly beneficial for those who need a fan but don’t have enough space on the floor. The wall fan works much like a ceiling fan but is situated on the wall where it gives sufficient ventilation to any room. The only downside, like the ceiling fan, is that it is fixed, but you have the option to make the head oscillate like a regular desk or stand fan. Most wall fans have grills, much like a stand fan or a desk fan, which makes them different from ceiling fans, which are usually open in design so they do not have grills. This is because wall fans can be easily accessible compared to ceiling fans so they need to have protective grills to prevent injuries from happening. Proper mounting and installation can help reduce the wobbling and you can do the same for an outdoor fan. Wall fans, unlike ceiling fans, usually have more color choices, such as black, white, green, red and others. The design makes the wall fan more attractive for various purposes such as for decorating your home with a specific color scheme. Some wall fans are also part of your home decor much like ceiling fans. This is why choosing the right color combination is important for selecting the best wall fan. You can also situate a wall fan outdoors. Some wall fans can be installed on a porch, terrace, deck, covered patio and the like for adding ventilation during the summer. If your outdoor area does not permit for a ceiling fan then a wall fan will do the trick. It is mostly seen in outdoor bars and restaurants as well as resorts that have small cottages along the pool. This makes it comfortable for the guests. If you need a wall mount fan that is meant for outdoor use, consider durable blades. Blowing power can be maximized when you choose 3 to 4 blades only and you choose metal blades to drive more blowing power for the outdoor use, since noise levels are not really an issue in an outside area. Fan blades can also vary per model. Most people and experts agree that 3 blades are the best because they take less blades for the motor to drive and spin, hence creating a faster airflow. If you buy from a reputable manufacturer or company then you are most likely going to get a blade replacement for free or for a very small add-on price, which is good. They also make it easy for your blades to last longer when interchanging. 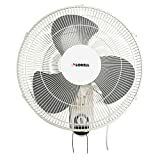 Size of the blades: a wall fan should be one that has the right size of blades depending on the size of your room so that they are not too big and powerful for small rooms and can suffice for a big room without lack of power. For industrial use, you should go for a longer bladed fan. Indoor or outdoor: Outdoor fans can be larger but this depends upon the size of your porch or patio so make sure you measure it first and keep all of the obstructions away from the wall mount fan as much as possible. You should choose the appropriate wall mount fan that is meant for outdoor areas based on its UL rating. Most outdoor fans have durable materials for the blade. 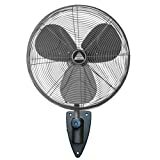 Number of blades: the number of blades can also affect the performance of a wall fan so it pays to check the blades as well when you shop for a fan. Three to four blades is the most common and you will rarely find more than that. This is because wall fans are meant for medium power cooling unlike the high power cooling of ceiling fans. Speed options: most wall fans have at least 3 speed options while some can have as much as 4 or 5. Having speed choices is important because you are saving the motor’s lifespan by reducing its operational speed when it is not needed, especially when it is already cold outside. Color choices: you should be able to select a good color choice or combination for your wall fan, especially if it will be part of your interior design and to match the color scheme of your room or area. Wattage: do consider a good wattage that is energy saving, most likely an Energy Star certified wall fan to make it easier to save up on monthly expenses for electricity. Look for one that has a low wattage but high power or CFM. Ease of setup: a good wall fan is one that is easy to setup and to put together. Because a wall fan needs to be mounted onto the wall, it should come with easy mounting instructions as well as some mounting hardware included. 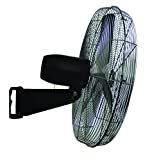 Durability: do consider a wall fan that has blades that are not flimsy at all. This means that it will last longer and the blades won’t be easily prone to damage. Having a durable wall fan means that you are getting more value for your money in the long run. Outdoor fans should be made of sun protected and weatherproof material. Ease of control: a good wall fan to consider is one that is easy to control. Most wall fans are controlled using the good old pull cord mechanism while some can even be remote controlled, especially the more expensive ones, and some high end ones can even be included in your home automation system. Warranty policy: the warranty policy of the wall fan will usually separate the motor warranty from all the other moving parts. You need to know from the manufacturer about this warranty policy for the wall fan and the return period. Do know that what you see online (if you’re buying online) can be different from what actually gets delivered in your doorstep, so make sure you get a good warranty policy. The Air King 9018 is our best wall mounted fan that is ETL listed, AMCA compliant and passed OSHA regulations. It has 3 speeds and has a pull cord and rotary switch like most wall fans. The motor is permanently lubricated for less maintenance. You can install this wall fan on schools, hospitals, offices and other public places. Its highest airflow is 1,970 cfm and its average wattage is 85W. While not a deal breaker, the Air King 9018 can be a bit noisy since it is meant for commercial usage, so it might not be good for bedrooms. 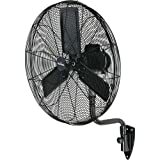 Our step-up pick is the OEMTOOLS 24883 Fan, which measures 24 inches and has a 2.4 amp motor with a sound level of 74 dB. It has a total of 3 speeds and can oscillate up to 90 degrees as well, blowing up to 6,500 cfm, it is great for industrial use as well. The durable metal structure makes this wall mount fan ideal for larger commercial and industrial applications for a cooler workspace. 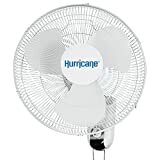 The Hurricane Classic 736503 is our budget pick, which measures 16 inches across and is also ET listed as a powerful and energy saving fan. The power cord measures 60 inches and has a total of 3 speeds on its motor. It has 2 pull cords for control. Consuming an average of64 watts, it runs quietly and can also tilt other than oscillate. It is backed by a 1 year warranty. The Lorell LLR49256 is an ideal wall mount fan for small rooms with low ceilings and has a size of 16 inches. Its head can be tilted other than oscillating and has a total of 3 speeds for its settings, which can be set with a pull chain as well. The JandD POW18 Wall44 has an airflow of 3,120 cfm and has an option to be mounted on the wall or on the ceiling, making it either oscillate or swivel. It is ideal for patios and areas with a humid climate. It is UL507 rated for outdoor use. The Home Decorators Natural Iron is a sleek black finish wall fan that has an air flow of 1,458 cfm. It has a decorative design that measures 18 inches and comes with 2 controls for the oscillating and speed. It is damp rated so you can use it on covered porches. The Sonic Breeze 16in has a white finish that is ideal for minimalist areas. Its metal mount makes it stable enough to reduce noise. It oscillates up to 80 degrees and comes with easy to use pull cords to select the speed and oscillation. The TPI CACU-30-W Commercial is quite large at 30 inches in diameter and comes with a permanently lubricated motor at 1/4 horsepower. It has an airflow of 6,000 cfm and has a ball bearing mtor, making it ideal for commercial use. The Misting Direct Fan is a rust resistant wall fan that has 24-inch blades that spin in a powerful way. You can use a pull chain to control the three speeds and the oscillating motion. It is ideal for commercial areas. 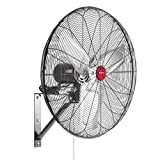 The GARRISON 2477844 Industrial is a wall fan that measures 30 inches and has a powerful 1/5 HP motor. It has 3 blades made out of aluminum and comes with 3 speeds to choose from. It is ideal for industrial use. Other wall fans were not included in our list because they were too flimsy and the instructions were not so good in setting them up. What’s more, the blade sizes are too small to cool down an average room, so they were ineffective at cooling in general. Q: What is a wall fan and how is it different from other fans? Cost Some are cheap and some are expensive. Usually the cheapest of all fans. The most expensive of all fans. Some are expensive but some are cheap. Portability Wall fans are fixed so you can’t move them from room to room. Desk fans can be portable. Ceiling fans, like wall fans, are fixed to the ceiling. Stand fans are movable but not as easy as desk fans. Home installation requirements Requires an open wall, does not require a high ceiling. Only requires a desk or drawer surface top. Requires at least 7 feet of ceiling height. Requires footprint space in your room. Design and colors Can come in a wide variety of designs . Can also comes in various colors. Limited colors, but blades are often shaped aesthetically. Can come in different colors and designs. Material of blades Wall fans usually have plastic blades but some are metal. Mostly plastic blades make up desk fans. Can be wood, plastic, metal, fiberglass or wicker blades. Can be plastic and some are metal. Q: What are the advantages of a wall mount fan or oscillating fan? The airflow is increased due to the improved cooling ability of the wall fan. The movement of the fan allows the air to flow from side to side and all over the room, causing in a better cooling capability for your room or outdoor area. This makes it efficient for your existing air conditioner during the summer or HVAC system in the winter to reduce on your monthly bill. They can cover a wider area as compared to standard table fans and floor fans because they can oscillate from left to right to cover an entire room, much like a ceiling fan. They can be good ventilation fans for those who have medium to large sized families that need a wide range fan but cannot install a ceiling fan due to having a low ceiling. The adjustability of a wall fan makes it ideal for those with a lot of cooling needs. Compared to a regular desk or stand fan, wall mount fans can cover the entire room and be adjusted up or down. There are automatic oscillating modes for it as well, like regular fans, so you can enjoy an automatic breeze indoors or outdoors. If your wall fan has a reverse function, then space heating is one of the best ways a wall fan can help out in the winter, since the blades can be reversed. You can have both a summer and winter fan if you purchase a wall fan with this kind of function, so you can also save more money in the long run with each season you go through with your wall fan. Most wall mount fans today can be remote controlled and can also be part of your home automation system, such as with Amazon Alexa, to make it easy to control the speed or the power of the wall fan. The remote control can be a convenient thing to have for seniors and those who just want a touch of convenience instead of using the pull cord or wall control for the fan. • Great for seniors and anyone who want total convenience for their fan control. • Ideal for home automation systems such as Amazon Alexa and the like, to simplify the switch between speeds for the fan. • You can control the fan at a safe distance to prevent the likelihood of injuries from happening. • Families with children need to be concerned on how to store the remote because anyone can potentially misplace it. Having a wall fan remote that is magnetized can make it easy to store with the unit. • You may need individual remotes to control different fans due to the conflict of frequency, unless you have your fans configured by an electrician for your home automation system. Most wall fans, like all fans, can have a timer so that they can automatically shut themselves off when a certain period of time passed by. This makes them more energy efficient in the long run, and is useful for when you want to fall asleep but needed someone to turn off the wall fan at a certain period of time to save up on energy costs. Q: What is CFM and why is it important in choosing a wall fan? A: The CFM of a wall fan means its air flow, measured in cubic feet per minute. Knowing the cfm of a wall fan is important so that you know if it is powerful enough to blow sufficient air for your indoor or outdoor setting, and if it is energy efficient in the long run. Q: What could possibly go wrong in a wall fan? The motor could have a problem if it is overused or something gets stuck in it. Moreover, motors that are not properly sealed are susceptible to rust, especially when placed in outdoor settings and in humid areas. Make sure that your motor is properly sealed so that you can protect the internal bearings from getting corroded and get a wet/damp rated wall fan for outdoor use. The wiring can also cause trouble if the it has pinches or loose ends and can potentially affect the power of the fan. Always check the wiring to see if there are any damage to any part of it. When possible, replace the wiring because it might also result to overheating when you didn’t take care of it. If the oscillation knob is not working then it is a mechanical problem. You can contact an electrician on how to fix the oscillation knob. It is not a big issue but it is if you often use the knob to swing the fan from left to right across the whole room. The blades can possibly wobble if the they are not properly aligned. Make sure that the wall fan’s blades are installed properly so that they don’t cause a jarring noise when they spin around. Check if the wall fan needs to be oiled or not. When in doubt, you can ask a repairman such as an electrician if you don’t know what is wrong with your wall fan. They know the best when it comes down to diagnosing the problems before they get wore. Sure, they can cost you a little bit of inspection fees, but in the long run, getting a checkup is better than spending more dollars for really pricey problems that the electrician needs to fix. If you don’t want to spend a fortune on another wall fan then consider taking care of it by getting an electrician’s help. Q: What is the best way to clean a fan’s blades? Using compressed air: this is a slightly expensive solution which uses a can of compressed air to clean up all of the blades in one go. Most compress air cans are found in hardware stores for you to purchase. Using an old pillowcase: this is a budget saver solution in which you can just grab an old pillowcase that you are no longer using to clean up each blade to get all of the sides and remove all of the dust. Q: What is the usual diameter of a wall fan and what is its usual angle? in addition to the diameter and angle, the number of blades on a wall fan is usually 3 to 4 because having more blades can make your motor suffer a lot. This is why most fans have aerodynamic blades in shape even if they only have 3 blades. Some can even have special blade sets over the whole set to add to the driving power, but this is usually a rare kind of wall fan. Q: How is a wall fan different from a ventilator fan? Installation Wall fans are installed on a wall. Ventilator fans are installed on the floor. Direction of air Wall fans move air from side to side using its oscillation. Ventilator fans move air upwards or downwards. Typical usage Wall fans are ideal for large rooms. Ventilator fans are ideal for multi floor houses. Q: Which fan should I have depending on the criteria I want: wall mount or ceiling fans? Installation Wall fans are better because they can be installed even in low ceilings. Direction of air Ceiling fans are better because they can blow air downwards or upwards. Cost Wall fans are cheaper than ceiling fans and are easier to install as well, so you can save more for the electrician fee. Power Ceiling fans are better in terms of blowing power compared to wall fans. Do remember that wall fans are like ceiling fans when it comes down to durability – you need to have indoor rated and outdoor rated fans in case you want to put them anywhere in your home or office area. Outdoor rated wall fans are usually more durable and have a sealed motor so that the elements will not get in their way. Properly sealed fan motor and parts mean that your fan is safe for the outdoor use. Q: What are the benefits of ball bearing for the motor of your wall fan? Dust and debris can be easily avoided with a properly sealed and functioning ball bearing motor for your wall fan. This is most likely the case if you need the wall fan for an industrial setting or for a home area that has a lot of pollution in the surroundings. The position of the wall fan can make a difference. Having an inclined position for the ball bearing wall fan means that motor oil will not tend to leak at all. Q: If a wall fan should be placed outdoors, what materials should the blades be made of? Having a good set of blades for your wall fan is important because it can help your fan to last longer and drive more power and air as well. The blades need to be in good shape each time you use the wall fan so that air will blow properly and the fan will not wobble at all. Q: What are the different outdoor or public places that can benefit from a wall fan? Patio or porch: if you have an outdoor wall fan in your patio or porch then it can help the guests to feel more comfortable during the summer and even on a hot day. 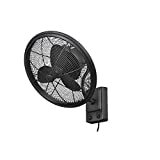 If you have many people in your outdoor area and you need some ventilation then having a wall mount fan on this location is very helpful, whether it is for your patio or porch. Just make sure it is UL rated for outdoor use. Resort cottage: you will mostly find an outdoor wall fan in a resort cottage or in the wilderness where ceiling fans and stand fans may not be applicable or available. Instead of a ceiling fan, a wall fan may be more convenient to install, since not all resort huts or cottages have a sturdy ceiling design, hence there is a need for a wall mount fan. The fan must be UL rated for humidity and waterproof qualities. Outdoor restaurant or café: if you have an outdoor café, bistro or restaurant and you have no space for an outdoor ceiling fan then an outdoor wall fan will probably suffice. The café can benefit more because of the wall fan and can ventilate the customers, especially when it is the peak of the summer season. Outdoor fans are helpful for customers and guests in general. Hotel terraces and decks: if you maintain a hotel or some other public establishment that has an upper deck or terrace, you can benefit from a wall mount fan. This is because the deck or terrace can get hot during the summer and this is where an outdoor fan can make the guests or customers feel more relaxed in warm days. Sunroom or garden space: a sunroom or garden space that has mostly guests and the like can benefit from a wall mount fan. For those who have their sunroom next to their patio or porch, adding a wall mount fan can help the guests feel more comfortable in hot days. Q: What are the usual specifications of a wall fan in terms of speed, wattage and the like? The energy savings you can have with a wall fan are much like with ceiling fans so it is great to use then along with your air conditioner or HVAC system for the winter. You can place a wall fan in the living room, in the kitchen, in a bedroom or in any area needing a fan but has a low ceiling. Most of these fans are quiet but it depends on how they are mounted, their materials and quality. Q: What are health benefits you can get from electric fans in general? They can help fight heatstroke, fatigue and dehydration. Any electric fan can help reduce the chances of fainting in the summer, especially when it is really too hot. Seniors and those with breathing problems as well as those who don’t have a lot of respiration power can benefit from any electric fan to help them get some fresh air when it’s really hot and dry. They can eliminate itching and rashes. An electric fan can help reduce the itchy feeling that most people get during the summer, especially when your climate is humid and hot, like in the tropics. In this kind of area, it can get hot and itchy and people can develop rashes. This is why an electric fan can help soothe the feeling by blowing cool air to keep itching away. Your blood pressure will not go up with electric fans. Those who have hypertension and other problems with their blood circulation can benefit from the use of any electric fan, especially during the summer. Seniors who have problems maintaining a good hear health can use an electric fan to help ventilate themselves when they feel that their blood pressure is spiking up. You will feel relaxed and less irritable. One of the best benefits of electric fans is that it can help soothe a person who is often stressed. If your workplace or home setting usually gets you a lot of migraines and headaches and you feel frustrated and irritated often, a gentle or even strong breeze from an electric fan can help you feel better. The kitchen temperature won’t be too hot so your food will be safe from bacteria. This kind of problem exists for those areas with a tropical climate or those with humidity and heat at the same time, where bacteria and sickness are common things to have with hot kitchens. Do consider an electric fan for kitchens where food is most likely to spoil or go bad. Fans are beneficial for babies, children and anyone with breathing problems when they sleep. Anyone with sleep apnea or chances of SIDS can get more ventilation out of a room if they have an electric fan around. If you can’t afford an air conditioner then at least getting an electric fan can help reduce the breathing problems when you or someone is sleeping. They are generally great for giving a good night’s sleep. If you have insomnia or just can’t really sleep properly then an electric fan can help you feel better without feeling guilty for the cost operating and in the upfront cost. A fan is usually cheaper than an air conditioner so it won’t hurt your budget and you can sleep in peace. If you have a low noise electric fan then it can help you sleep better at night. Q: What causes wobbling and vibration when a wall fan operates? • The fan’s installation is not very well-thought so there could be some loose parts. This is why you need to consider getting an electrician if you are not sure, or you can check for the loose parts, if ever. • You should also consider checking the blades if there are some dents or warping. Do consider replacing the blades or as advised by the electrician. Q: If my wall fan is indoors, where is it best to use them? • Bedrooms and master bedrooms – they can be placed in a bedroom but make sure that the motor is not very noisy for you to sleep better. • Living rooms (TV rooms) and family rooms – again, do consider a wall mount fan that does not make too much noise so you can watch TV peacefully. • Kitchens and pantries – the wall mount fan should be powerful enough to push the hot air from the kitchen to remove odors and cooking heat. • Dining rooms – the wall mount fan should be placed strategically so that all people in the dining table are given ventilation in a proper way. At least 2 fans could be a great solution for that. • Recreational rooms or play rooms – if you have a game room or recreational room, whether at home or in the office, you can properly ventilate everything with a wall mount fan if it does not permit for a ceiling fan due to the ceiling height requirements. You can also help your A/C not to overwork itself. • Attics and basements – do consider having wall mount fans on attics and basements, where ceiling fans might not always be applicable due to the height of the ceiling and the small space left. The wall fan is a great solution if you don’t have room for a stand fan or desk fan, either. • Offices, shops and commercial spaces – for those who want a commercial use wall mount fan, it needs to be durable such as those with metal blades for corrosion resistance and blowing power. You also need to consider bigger fans if you want to cool down a large room. Q: What are the different fan ratings by UL? Q: Which properties are important when generally selecting any electric fan? • RPM – rotations per minute or the speed of the spinning of the fan blades. • Pitch – refers to how the fan blades are connected to the blade holder. • Shape – refers to the shape of the blades that can significantly reduce drag. • Size or length – can refer to the length of each blade in the fan. Q: Why should you not disassemble a wall fan without an electrician? A: An electrician knows best when it comes down to servicing the wall fan, so make sure you only touch the outer parts to prevent voiding your warranty or causing injury to you and the fan. Q: What tools are needed to install a wall fan? Q: What are the kinds of materials used in metal wall fans? The Air King 9018 is our best wall mount fan for its industrial durability and energy efficiency due to the 2.4-amp motor.